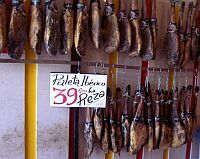 Jamon Serrano, or Serrano ham, is a particularly Spanish food. The nearest thing to it is the Italian prosciutto. The hams are initially taken from white pigs, then, after being cleaned and trimmed, are stored in salt for a couple of weeks. This dries them out. Next in the process, after the salt has been washed off, the hams are hung for about six months, to thoroughly get rid of any water. It doesn't end there! Finally, the dried hams are hung in a cool, dry place for up to 18 months more!Thereafter, the hams take their place on a special stand behind the bar in typical Spanish tapas bars and, indeed, slices of the food form a very popular Spanish tapa.I've found that it is quite often this ham that is served up in British restaurants as an accompaniment to melon. If this ham is not of very good quality, then it can be quite tough to eat, but a decent cut of this meat is succulent and tasty. The ham is more flavoursome than country ham and has less fat than prosciutto. 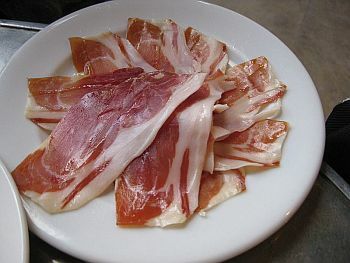 The long curing process significantly enhances the flavour.If you order this in a tapas bar, you'll be served with several slices on a plate (as in the image above) and the ham is eaten raw, often with something else, such as Manchego cheese. For home use, you, naturally, don't want a full leg of ham - it'd last forever! Serrano ham is available in supermarkets, presliced and vacuum packed.